(PRLEAP.COM) Rated by ItsBlockchain.com, as "Best of 5 token sales globally," Solve.Care Foundation announced the start of its token sale period, which will last from March 31 to April 15, 2018. Solve.Care will offer Care Administrative Network (CAN) tokens at the price of $0.10. Everyone who would like to participate can sign up here. "Only 138,000,000 CAN tokens now remain," Mr. Goel continued. "Interested individuals should act soon. After our token sale ends April 15, all unsold tokens will be burned." Ranked #1 at this year's Best of North American Bitcoin Conference for its innovative healthcare blockchain platform, Solve.Care is already generating revenue though its multi-year contract with Arizona Care Network, a leading accountable care organization (ACO) with more than 5,000 physicians and 250,000 members. The Foundation's long-term aim is to dramatically improve global healthcare access by reducing costs and streamlining payments among clients, consumers, employers, insurers and government agencies. 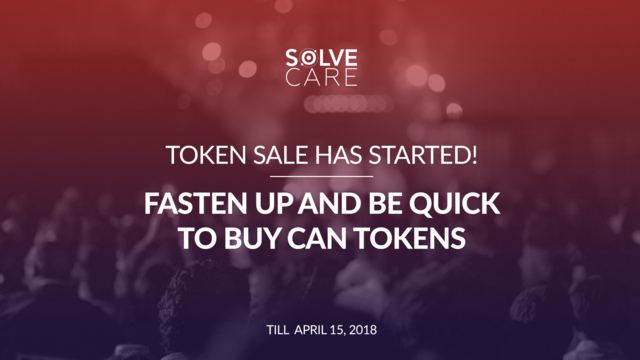 Solve.Care Foundation was established with the goal of revolutionizing the administration of healthcare benefit programs globally. The stated mission of Solve.Care is to make healthcare and benefit programs work better for everyone by fostering a relationship-centric approach to care coordination, administration and payments that addresses all three pillars of healthcare: clinical, administrative and financial. "The ultimate goal is to alter the way healthcare is administered around the world by applying blockchain to delegate greater authority to patient and physician without a loss of control," Mr. Goel has said. Mr. Goel has spent more than 26 years in healthcare technology. During that time he built four healthcare technology companies which were featured multiple times in INC 500's list of fastest-growing companies. He has also been named one of the 100 most-promising entrepreneurs worldwide according to a Goldman Sachs report. In 2011, he was appointed by the Governor of North Dakota to help direct state-wide health record initiatives for insurers and consumers. From 2012 to 2017, Mr. Goel spearheaded two U.S. Presidential healthcare initiatives that led to public program enhancements for Medicaid and Medicare as well as other programs.